Want to feel like you’re in a Brothers Grimm fairytale? Visit Mittenwald and Oberammergau. Remember Samantha Brown’s Passport to Europe? I used to religiously watch that television show after I graduated college and had no travel plans on the horizon. I lived vicariously (and enviously) through her travels each week. Of all the shows, the one that stood out to me the most was the Bavaria episode when she visited the towns of Mittenwald and Oberammergau in Germany. I had somehow never heard of these little German towns tucked away into the hills of the Bavarian region about an hour south of Munich — little mountainside towns that had so much character, which it seemed was mostly because they literally did have characters painted onto the side of the town’s buildings. 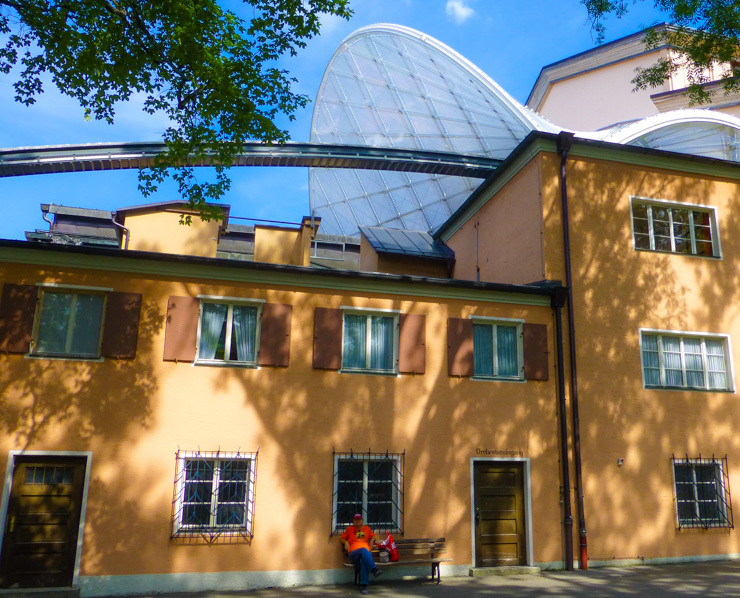 I was in awe, glued to my television screen as Samantha Brown drew me in with shots of colorful frescoes covering the stucco walls of centuries old houses and shops against a backdrop of the Bavarian countryside. The intricately drawn figures and flowers seemed to make the towns come to life, like some animated tale was going on at the same time as the day to day life of the villagers. From the day I saw that Bavaria episode, I knew I had to go to Mittenwald and Oberammergau someday. And yet I didn’t. I went to Europe a couple more times after watching that episode, but never made it to Bavaria. Years passed and I traveled to other continents, still skipping over those two little German towns. But I never forgot Mittenwald and Oberammergau…until I finally saw them with my own eyes. And now I certainly won’t forget them. 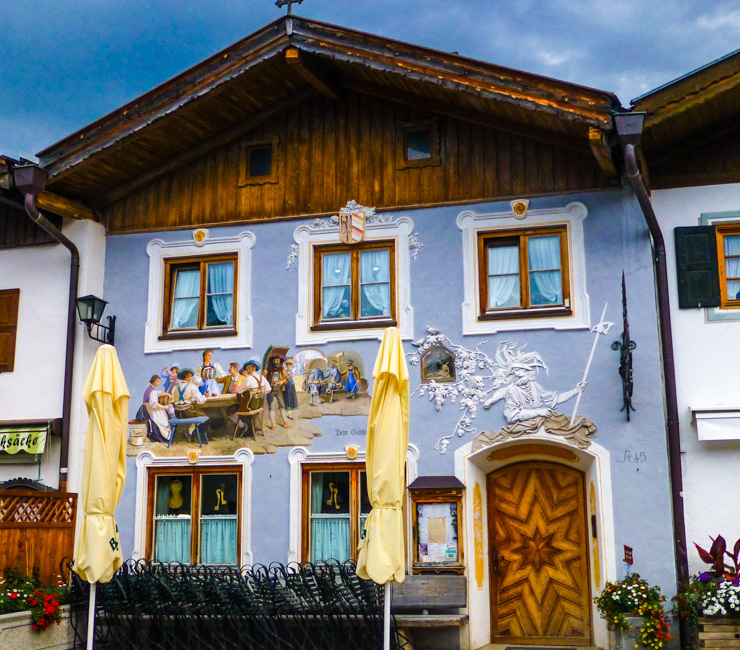 I arrived in Mittenwald first, tired from several days of rock climbing and hiking in the Dolomites of Italy, but excited to find the frescoes. I didn’t have to use much more energy to find them. Frescoesd buildings are pretty much the norm in Mittenwald. 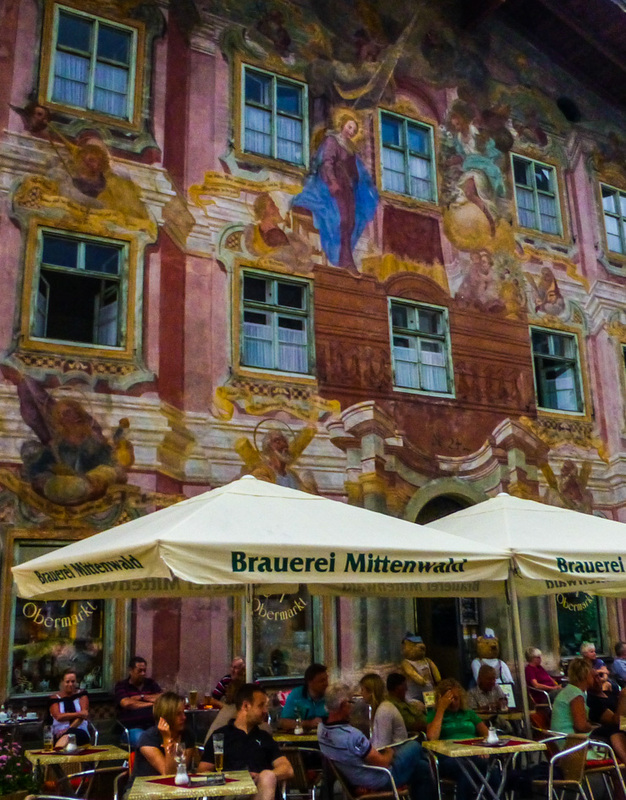 You can even dine right underneath an elaborately decorated frescoed building in Mittenwald. A couple turns after leaving the hotel I was staying at (the clean, efficient and friendly Hotel Bichlerhof) I had arrived at the main street…and was staring at one of the most adorable streets ever. 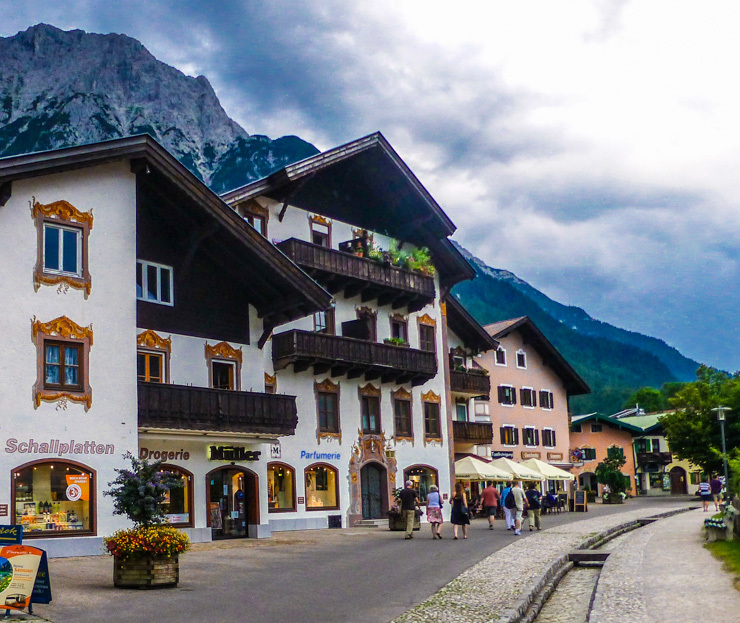 Cutest, quaintest, most charming…this is one time those cliché travel adjectives need to be used because that is what Mittenwald is. Cute and quaint and charming. But Mittenwald was also surprising. For one, it was bigger than I was expecting. Still walkable, but I wasn’t expecting to have such an obvious “main street.” The main street was also interesting in that it had a stream running through it, upping its unique ante and making it memorable for more than just its glorified frescoes. Water trough running through the town of Mittenwald. 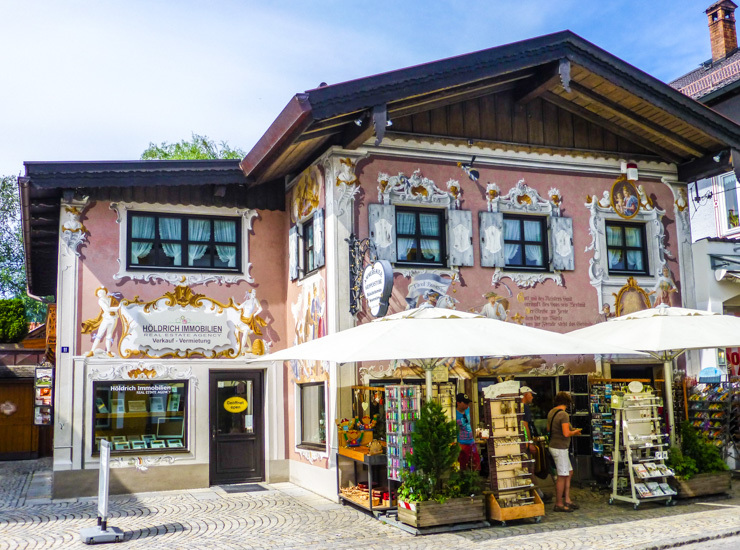 There were also plenty of shops and restaurants to choose from as well as other sightseeing attractions to pass the time there, such as the Geigenbau Museum about the history of violins in Mittenwald and the frescoed Church of St. Peter and St. Paul. Church of St. Peter and St. Paul in Mittenwald. 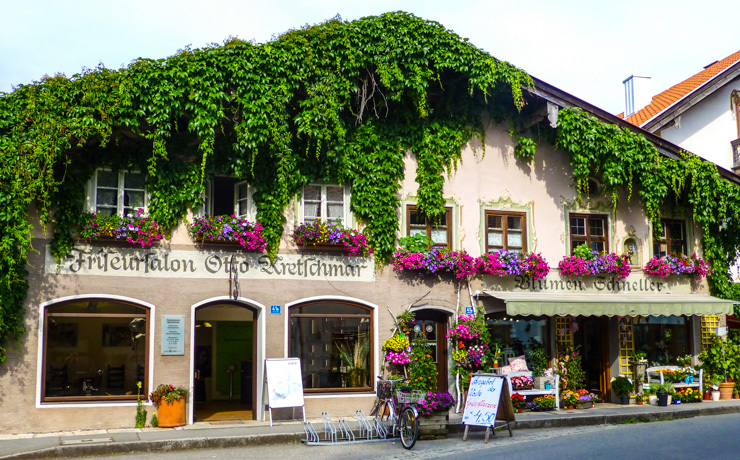 Mittenwald was much more than just its main street (which has the actual name of Obermarkt). Little streets and alleyways created curves around the town, each one providing more painted on scenes to behold on the buildings. Residential areas unfolded in colorful neighborhoods framed by the green scenery of Bavaria. It was an easy and pleasurable city to get purposefully lost in. 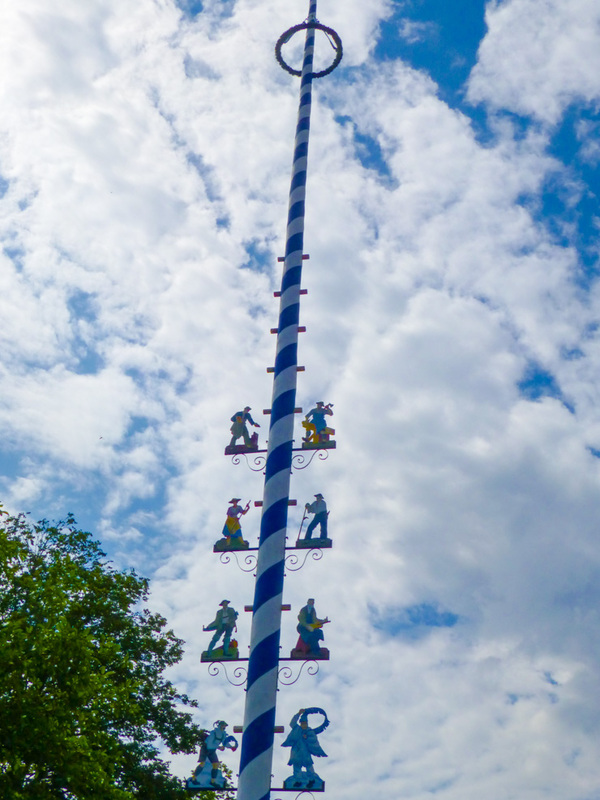 Even the poles in Mittenwald have a colorful Bavarian charm. 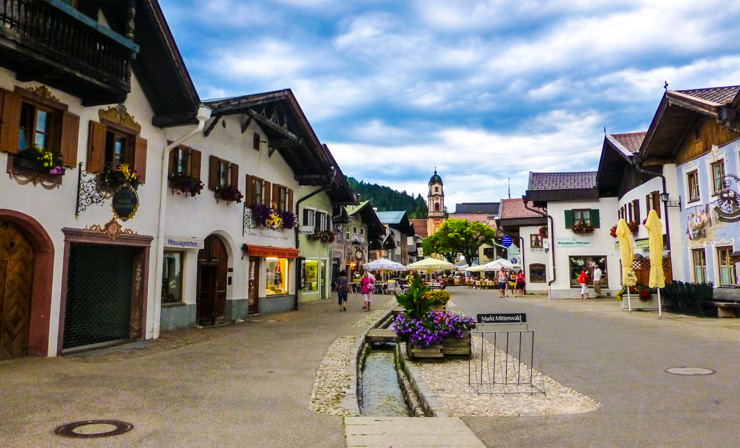 But as much as I loved Mittenwald, Oberammergau was also calling and after a 40 minute drive heading northwest through Bavaria, I was soon exploring the other little town Passport to Europe had informed me about a near-decade earlier. The decade aspect also comes into play quite prominently in Oberammergau. Back in my post college apartment watching the Bavaria episode, Samantha Brown had also regaled me with information about the play that was brought to life every ten years in Oberammergau: the Passion Play. I’d been a part of my church’s yearly Passion Play in 9th grade and this seemed to take the Christian telling of the death and resurrection of Jesus Christ to a whole new incredible level. Every ten years about 2,500 townspeople (roughly half the town, all of whom have to be born there or residents for at least 20 years in order to participate) dress up in costume and put on a 5-hour performance of the Passion of Jesus Christ with a 3-hour break for dinner. They do over 100 performances throughout the year. It has been going on since 1634 when the townspeople started it in the middle of the 30 Year War after a horrible bout of the plague ravaged the town. The people of Oberammergau made an oath to do the play every ten years in an attempt for deliverance and health for the town. They started it in the cemetery where many of the friends and family who had perished from the plague were buried. The open-air theater where the Passion Play is performed every 10 years in Oberammergau, Germany. Though I wasn’t there in the right year to see the performance, which had last happened in 2010 (and which I’d learned through my last job begins to sell out years in advance) I was still able to see the building where it was performed and imagine what it must be like. This was a picture I took of a picture that was displayed next to the theater during a Passion Play performance. The town also very much focuses on the play. Many of the frescoes are related to the Passion story, and religious statues and Jesus on the Cross renderings are found throughout town. 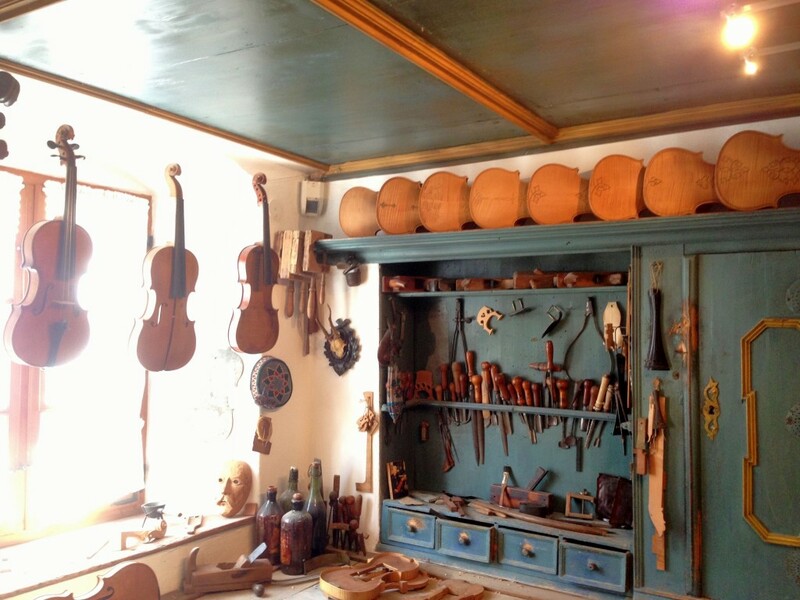 In addition to the Passion Play, Oberammergau is known for its local wood working, which can be very intricate, like this depiction of a violin making shop I took a picture of while window shopping in the town. An example of woodworking craftsmanship in Oberammergau. 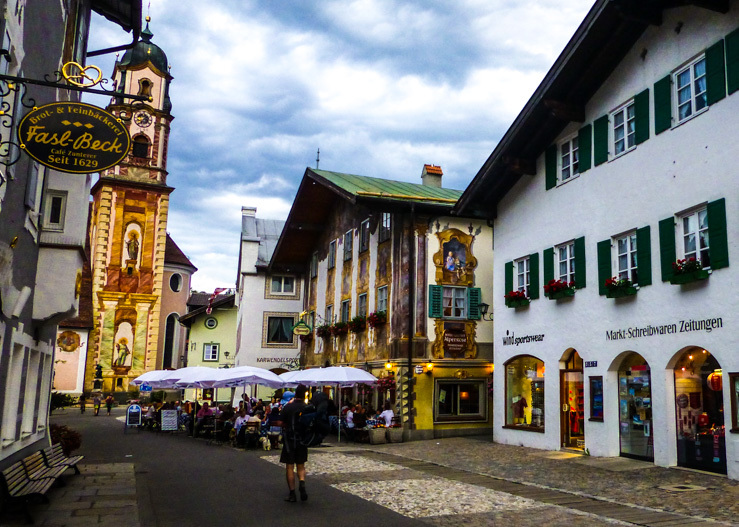 Just like Mittenwald…the town of Oberammergau was quaint and charming and wonderfully compact and walkable. Not every building has frescoes on it, but even the ones without were still reminiscent of something out of an old folks tale, like this flower-adorned one. 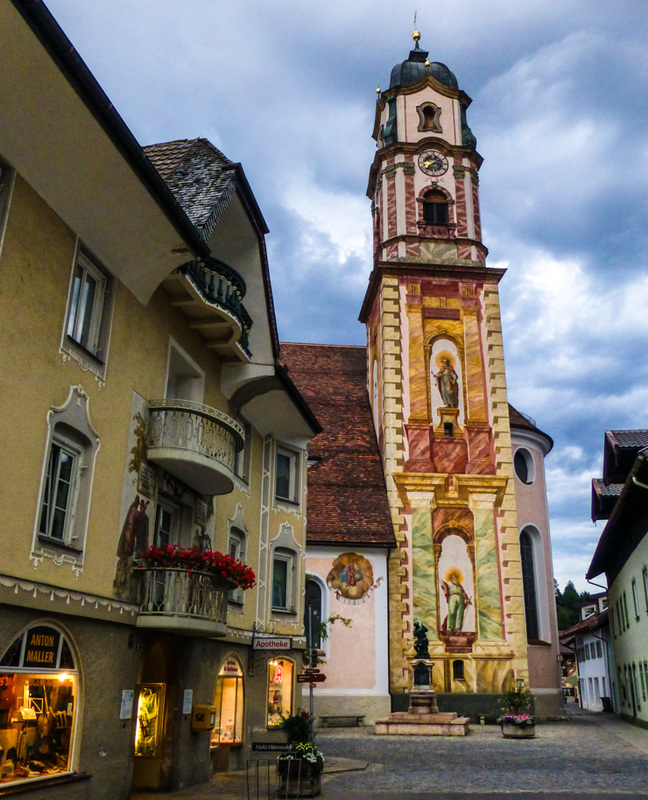 As I walked around both Mittenwald and Oberammergau, I couldn’t help but feel giddy that I was there. I had finally made it to these two little towns I’d always wondered about and if they would be as special as they looked on tv. Turned out they were. I felt like I was in my own little travel storybook. Maybe I should fresco a scene from that in my office at home. On second thought, I think I’ll leave the fresco work to Mittenwald and Oberammergau. They seem to have an excellent handle on it.